This English learning activity is something that might inspire you to take action if you are afraid of getting rejected. It’s based on a TEDx Talk by Jia Jiang, who grew up in Beijing, China but moved to the United States to pursue his dream of becoming the next Bill Gates. Flash forward more than 15 years later and Jia Jiang has achieved his American dream, but not his original dream. His talk is not just an entertaining story but it is a call for all of us to join him on this adventure of overcoming rejection. What exactly is rejection? Rejection is a refusal to accept, approve, or support something or someone. You can apply to get into a university and receive a rejection, ask someone on a date and get rejected, or ask for a raise and get a rejection. Whatever it is, rejection often hurts. This English learning activity will give you some practical tips to deal with rejection and a chance to practice your English at the same time. 4. Leave comments on what you think about the video. 5. Repeat if you want more practice. Click here to take the short quiz. So how many of you believe in purpose in life, that you’re put on this earth for a reason? Raise your hand. A lot of you. Good. How many of you in the pursuit of that purpose see your dream dashed in front of your eyes? Raise your hand. I see some hands, getting personal, thank you. And how many of your lives got changed by a box of donuts? Raise your hand. I see one, two, let’s have dinner together afterwards I want to hear your story. That’s awesome. But my life also got changed by a box of donuts. Here it is. It changed my life so much that it can be divided into before donuts and after donuts. BD and AD. Growing up in Beijing, China, I did not want to be a revolutionary leader or a model worker. I wanted to be Bill Gates. He came to my hometown to speak when I was 14 years old. I loved his story. I loved the fact that he blazed his own trail and made the world a better place. For those of you who are Mac users you might dispute that. But I love his story. I said actually I like him so much I said I’ll go where he lives. So I came to the States when I was 16, dreaming to become a world-class entrepreneur. Then I did all the wrong things. 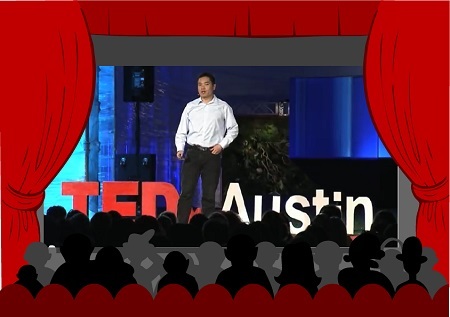 Share Your Thoughts About Jia Jiang's TED Talk! 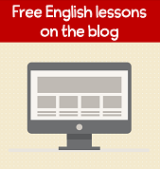 Ready to practice your writing skills? - What did you think of Jia's talk? - Are you afraid of rejection? If so, how much? - Would you like to try Rejection Therapy? Why or why not? You can answer any of these questions or just share other comments. We'd love to know what you think! You can also watch Jia Jiang's TED Talk on their website.